If you’re looking to increase the security and privacy of your home, or improve the look of your landscape, then consider a wood fence. Are you thinking about getting a new fence installed this fall? If you’re looking to increase the security and privacy of your home, or improve the look of your landscape, then consider a wood fence. 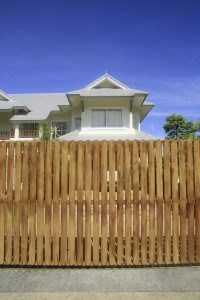 Here are some more reasons why you can benefit from installing a wood fence. The first benefit is that your home will have increased security. Your home should be a sanctuary, a place to escape from the busy world and our hectic lives. Your children and pets should be able to play safely, unworried by anything that could come to disturb them. Maybe you’re looking to keep squirrels and deer from ruining your garden or yard. In any case, a wood fence might be your best option. What does your current landscape look like? Not only will your new wood fence protect your landscape, it can help make your yard look better too. Besides, wood fences are attractive and won’t be going out of style. Whether you’re looking for an iconic picket fence, or one with panels, you improve how your home looks. If you’re thinking about selling your home in the next few months, consider the merits of a wood fence. After all, you never know – the fence you put in today might be what convinces a future homebuyer to pay you more for your house when it comes time to close the deal. Maybe your other priority is increased privacy. How is privacy different from security, you might wonder? Well, the two factors do go hand in hand. But with a wood fence in place, you can create a safe haven in your yard where no one can see what you’re doing if you don’t want them to – perfect for keeping those nosy neighbors out of your hair. If you’re looking for some alone time so you can read or meditate or contemplate the meaning of life in some peace, the improve privacy a wood fence provides could be just the thing you need. This entry was posted on Friday, September 15th, 2017 at 9:10 am. Both comments and pings are currently closed.